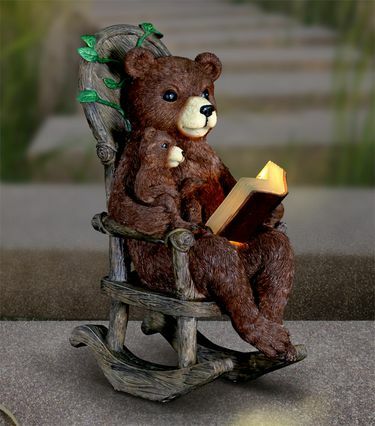 Rocking & reading with a youngster snuggled close, this nurturing bear garden statuary is an endearing addition to your garden. With solar powered LED lights, bears will never put that book down, day or night! Makes a great gift for the inspired reader, teacher, parent, grandparent and garden enthusiast! Size: 8.75" x 6.75" x 12.25"H., approx. 4.25 lbs. Garden Fox Statue | Wolf Pup Garden Statue | Standing Coyote "Ultra-Realistic" | Silly Solar Welcome Raccoon w/Birds | Raccoon Statue | Rustic Finish Garden Bear | Playtime Bears Garden Sculpture | Premium Bear w/Candle Lantern | Bear Cub Statue | Silly Solar Welcome Bear w/Birds | Solar Bears Reading in Rocking Chair | Solar Grizzly Bear w/Jar of Fireflies | Fierce Bear Statue "Ultra-Realistic" | 18" Large Standing Bear w/Welcome Sign | Solar Fisherman Bears w/Welcome Sign | Garden Deer Statue | Solar Deer Light | Meadow Wandering Deer Sculptures (Set of 2) | Majestic Woodland Deer Sculptures (Set of 2) | small moose phatzo | Standing Moose Statue "Ultra-Realistic"